You will find dates for our meeting in the bulletin. World Youth Day (WYD) is a amazing and life changing event which has touched many young people. WYD is held in various countries around the world every three years. These events show us that our Catholic faith is truly universal. Many young people talk about a tangible experience of joy when coming together with the youth of the world to give praise and glory to God. Our parish strives to send a group of young people from our parish to each WYD. If you would like to attend the next WYD please get in touch with us. The next World Youth Day will be Panama 2019. If you are able to help out with running events please let us know. 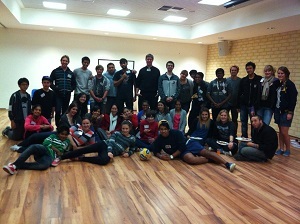 This is a St Vincent de Paul group for young people. The group is involved in fundraising, volunteer work and public awareness of social justice issues.